We train our communities to prevent and mitigate disaster risks. 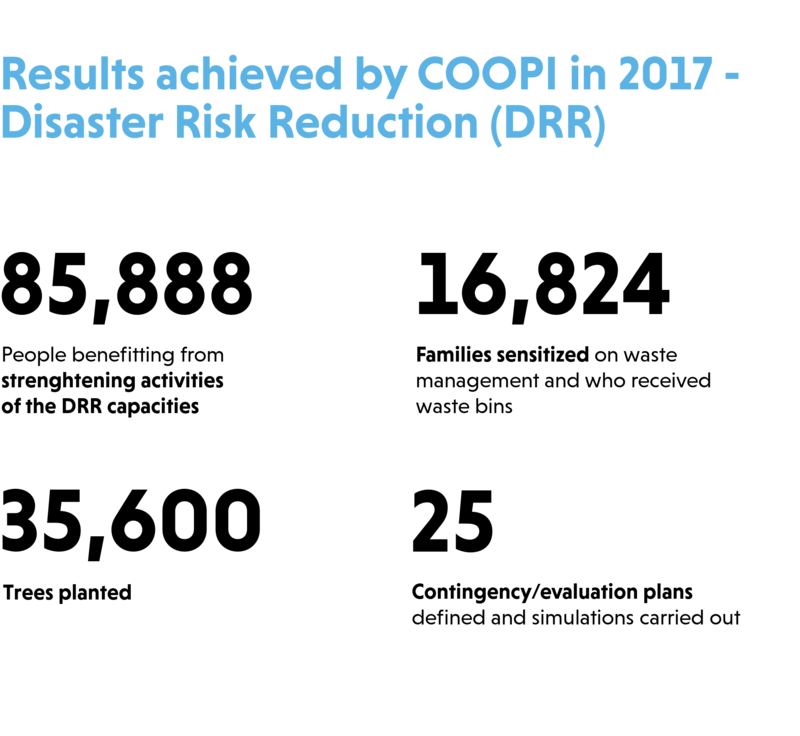 COOPI provides support to the communities in which it operates so that they can deal with extreme events such as earthquakes, floods, tsunamis, drought, landslides, hurricanes and volcanic eruptions. COOPI’s programs in the sector are predominantly based on the creation of geographical information systems on the territory’s resources and vulnerabilities, the carrying out of risk analyses, the strengthening of risk and crisis management capabilities at community and institutional level and the transfer of know-how. More specifically, we promote awareness-raising and the involvement of vulnerable communities, institutions and other key players when drawing up development plans that incorporate risk reduction priorities, outlined on the basis of the studies carried out. We reinforce the coordination mechanisms for the timely carrying out of emergency response and early warning operations by improving disaster preparedness capabilities, preparing contingency plans, implementing mitigation works and supporting infrastructures (construction/reconstruction of emergency operation centres, shelters, evacuation routes, etc.). Moreover, we promote optimization in the use of natural resources, and the development of processes of adaptation and mitigation of the effects of climate change by means of activities that raise awareness, provide support for managing the territory, protect livelihoods and promote the use of energy-efficient resources. The project aimed at building a georeferenced database of essential resources for response and early recovery that would serve to predict an earthquake or a tsunamigenic event. In Malawi interesting practice using renewable energy for livelihood protection was implemented.